Samsung batteries are quite hard to find in the UAE as there isn’t much of a demand. But we would like to support Samsung customers, helping them to find spare parts for their laptops fast and easy. We sell high quality compatible or original Samsung batteries for Samsung laptops. Kindly submit an inquiry and we are more than happy assist you today. If you are having a hard time to find your Samsung battery model visit How to find my battery model page or simply send us an inquiry. We supply high quality standard (ISO 9600) batteries to our customers. 1 Year limited warranty for most of models. Fast shipping to all parts of the UAE. We can guarantee you the lowest price in the market, with better customer service. How to increase my Samsung battery life? 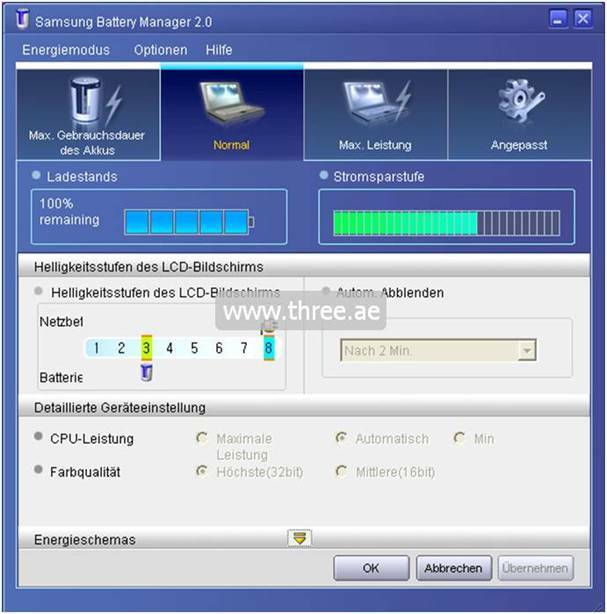 We recommend using Samsung battery manager to understand your battery life cycles first and then based on that you should be able to follow our steps to increase your battery life on here. Visit How to increase my battery life page. In general all Samsung batteries are different to each other. Not like other laptop brands the Samsung has many different shapes, colors and capacity batteries in the their product line. These are the most popular batteries in the region. However below models are not available in the UAE market, if you wish to make an order kindly contact us. Kindly note that we keep only fast moving models for Samsung laptop batteries and some models may not be available with us. We are working on increasing the product range, however if you require a battery that’s available with us, you can easily place a back to back order. You can visit our website in order now page www.three.ae to place an order anytime. We will require a few details from you, such as the model number or the battery part number. You can easily find the Samsung laptop model number from the back side of the laptop or left corner of the screen. If we require additional information we will ask you the year of purchase and County that you purchased your laptop. If we have in stocks we can deliver on the same day however special models will take 7 – 10 working days and may vary due to other reasons. Kindly contact, Three.ae sales team to understand your batteries availability and the time frame of your order. We can supply battery and charger for these models.